which stood 1 mile W.
Location. 35° 3.25′ N, 78° 52.95′ W. Marker is in Fayetteville, North Carolina, in Cumberland County. Marker is on Hay Street, on the right when traveling west. Touch for map. Marker is in this post office area: Fayetteville NC 28301, United States of America. Touch for directions. Other nearby markers. At least 8 other markers are within walking distance of this marker. Settlement of the Upper Cape Fear (within shouting distance of this marker); Scotch Spring (about 500 feet away, measured in a direct line); Plummer Bridge (approx. 0.2 miles away); Currahee Rocks (approx. ¼ mile away); Charter of the University of N. C. (approx. ¼ mile away); First Presbyterian Church (approx. ¼ mile away); Town House (approx. ¼ mile away); Old Town Hall (approx. ¼ mile away). Touch for a list and map of all markers in Fayetteville. Regarding Sherman's Army. In late 1864, Union General William T. Sherman began moving his forces, some 60,000 battle-hardened soldiers strong, northward from Atlanta to “divide the Confederacy in two.” The plan was to march the Union forces through Georgia, South Carolina and North Carolina in order to squeeze Confederate forces under General Robert E. Lee in Virginia between Sherman’s men to the south and those of General Ulysses S. Grant to the north. Along the way, Sherman hoped to disrupt Confederate supply lines and break the will of southerners on the home front. This “total war” assault on civilians – women and children included – by Union forces was a break from traditional warfare that had, up until this time, focused largely on military targets. whole towns in ashes. As they approached North Carolina, Sherman’s forces were divided into separate divisions or corps. They traveled across the state to protect each other’s flanks, forage for supplies and to spread their influence throughout the state. The forces were more restrained in North Carolina because many had grown uncomfortable with the wholesale destruction wrought upon South Carolina. Additionally, North Carolina had been the last state to secede and was home to many Unionists who fostered the largest peace movement in the Confederacy. 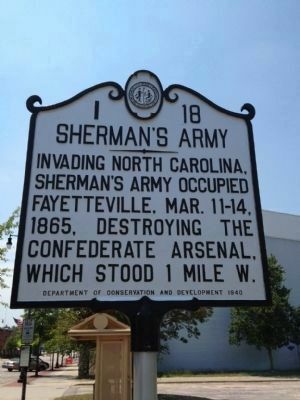 Union forces under Sherman entered North Carolina in early March and trekked northward through the state, engaging in skirmishes and battles, before exiting the state on May 4, 1865. More. Search the internet for Sherman's Army. Credits. This page was last revised on June 16, 2016. This page originally submitted on July 8, 2012, by Mike Stroud of Bluffton, South Carolina. This page has been viewed 340 times since then and 6 times this year. Photo 1. submitted on July 8, 2012, by Mike Stroud of Bluffton, South Carolina.